Wednesday night: Partly to mostly cloudy. Mild. Low to mid 60s. 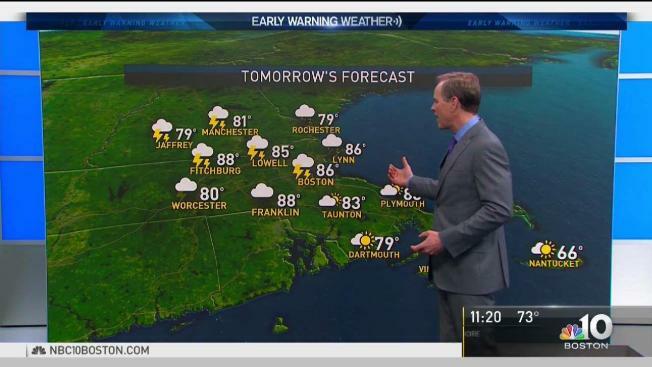 Thursday: Partly sunny with plenty of afternoon storms. Low to mid 80s. Friday: Partly sunny. Afternoon storms. Low 80s. Our first bona fide summer weather preview has arrived! With temperatures soaring into the 80s, summer lovers will delight, especially with relatively low humidity making for a rather comfortable heat by New England standards. Boston officially hit 81 degrees around 11 a.m. Wednesday for the first time in 208 days. Last year, the first 80 degree day happened on April 11. Of course, spring heat often comes with some trade-offs: pollen bursts, brush fire danger on the rise, and the UV index soars high enough for sunburns. Kids, adults, and pets, alike, will want to stay hydrated, as the heat will be a bit of a shock to the system after our recent cool weather. Also, keep in mind ocean and lake waters are still very chilly! Though humidity will gradually rise overnight, most of us won’t really notice the difference until Thursday, when increasing humidity and continued heat will provide fuel for scattered thunderstorms to develop ahead of a very slowly approaching cold front. Some Thursday thunderstorms may become strong, with locally damaging wind gusts, so remember the old saying, "When Thunder Roars, Go Indoors." If you can hear thunder, lightning is a risk. Humidity is likely to continue Friday for many, and this will mean occasional showers and embedded thunder until the approaching cold front finally passes New England, overturning the air and leaving a pleasant weekend. In fact, pleasant air sticks around through next week in our exclusive Early Warning Weather 10-day forecast. Download our free mobile app to track the latest weather conditions.